Once you have seen central Kathmandu set out and explore the treasures around Kathmandu: the historic squares, temples and royal cities. And get up on the hills around Kathmandu for views of the Himalayas, the world’s highest peaks that make Nepal famous. Kathmandu has some extraordinary cultural sights right outside the city: the Monkey Temple Swayambbunath in the west, Boudanath and Pashupatinath temples in the east and the ancient kingdom of Patan in the south. All of them make great day trip destinations. For Himalaya views go south to Chandragiri Hills where you get to 2500 m by cable car. Or take a jeep and travel north to Shivapuri National Park. This post will show you where to go around Kathamndu, Nepal. I will show you Swayambbunath, Boudanath and Pashupatinath, Patan Durbar Square, Chandragiri Hills and Shivapuri National Park. But that’s not all. The Kathmandu Valley has two more places to go, Bhaktapur and Nagarkot. Bhaktapur is an ancient city east of Kathmandu and further east is Nagarkot, a mountain village of on the Kathmandu Valley rim that also has fantastic Himalaya views. To read about Bhaktapur and Nagarkot check out my other post Nepal: Nature, Culture and UNESCO Sights and the same post also shows you Kathmandu city center Thamel and Durbar Square. The map shows the locations of temples are Himalaya view points around Kathmandu. For a closer view of the locations click the right up corner of the map to view it in Google maps. Nepal is a country with thousands of years of heritage and both Hindu and Buddhist traditions. That’s why small temples and shrines exist in almost every corner. The photo shows one of the many central Kathmandu temples. However the three biggest temples are around Kathmandu, one in the west and the two others north of the airport. They are Nepal’s finest temples which UNESCO has taken on their World Heritage list. These fine temples around Kathmandu are Swayambbunath, Boudanath and Pashupatinath. Swayambbunath is a Buddhist temple located on a hilltop west of Kathmandu, close to the ring road. It’s in a wooded park and needs climbing stairs. The park has a monkey population which is why Swayambbunath is also known as the Monkey Temple. The place where the temple stands has a religious background since 2500 years back in time. They say the Kathmandu Valley used to be a lake from which the Swayambbunath hill suddenly rose. And that’s also what the temple’s Nepali language name tells. Swayambbunath has one big white stupa and many small ones that stand for different purposes. To keep the big stupa snow white they paint it every year and at the same time add yellow stripes. The yellow stands for lotus. The spire on the top has 13 levels which stands for the 13 stages you need to take to get to Nirvana. Above the spire stands one more round thing that is an umbrella. The umbrella has its own religious meaning. And then there are the prayer flags, thousands of them in five colors: blue for the sky, white for the wind, red for fire, green for water and yellow for earth. Buddhist flags contain text. That is written mantras and the flags spread the mantras and prayers to all. And the Monkey Temple really is a perfect place to stare out in all four directions. You get a good overview of the whole city and evening sunset over Kathmandu skyline also is something to see. Buddhists walk around their temples and the rule is to walk clockwise. And as they walk they touch the long rows of prayer wheels around the dome. The Monkey Temple is one of Kathmandu Valley’s eight UNESCO Cultural Heritage Sites. How to get to Swayambbunath: walk across Vishnumati River from the city center or take a taxi. The temple is next to the ring road in the west. The next UNESCO temple Boudanath is located 5 km north east of the city in the middle of a busy suburb. The temple is on flat land and inside a block so you can’t really see it from the street. But look for a decorated gate where people go in and out. Yet this is Nepal’s biggest stupa and the dome is gigantic. This one too is shining white and has prayer flags in five colors hanging from the top. Boudanath stands on a round square that has pastel painted houses around it. And the houses look just like old European town houses! The square is full of people. In evenings thousands of locals gather here to walk around the stupa. It’s a ritual and they all walk clockwise. It’s impressive that so many people walk together and many of them keep walking for hours. There are many Tibetan monks among the walkers. They live in monasteries around Boudanath which is one of the world’s main centers of Tibetan Buddhism. The history behind that is that as Boudanath was located on the old trading route to Tibet Tibetans wanted to stop here and pray before heading out to the Himalayas. So Boudanath Temple is one of the eight UNESCO Cultural Heritage Sites around the Kathmandu Valley and absolutely needs a visit. How to get to Boudanath: by taxi. If you are visiting Boudanath and Pashupatinath at the same time you can walk between them. As Swayambbunath and Boudanath were Buddhist this is a Hindu temple. Pashupatinath is Nepal’s main Hindu temple and dedicated to the Hindu god Lord Shiva. It is also a sacred place for all Asian Hindus. Pashupatinath temple grounds are huge, this the largest single temple area in Nepal and a lot bigger than Boudanath’s area in size. Pashupatinath Temple is a walking distance from Boudanath so it’s a good idea to visit them both on the same day. We however came here twice and it happened to be a cloudy day at Pashupatinath. The area of Pashupatinath doesn’t look attractive at all when you arrive. There is a dusty plain, a huge parking area and then these rows of stalls selling religious stuff. But go in, Pashupatinath is going to touch you and you will learn about Hindu habits. To learn even more take a private guide, they will approach you at the gate. Pashupatinath Temple stands on a river bank and the area is full of smoke – from cremations. The river looks grey and dirty, yet it is the holy Bagmati River that flows to Ganges. For that reason many Hindus are cremated here and there are always many fires. Family members gather around the body and make the fire and at the end the ashes are spread into the river. There are separate areas for low and high caste cremations and a place where Nepalese royal cremations used to take place. You can stay and watch cremations going on if you feel like that. Or you can take the stone steps up to the hill and watch from there together with monkeys. But monkeys are not the least interested in what’s going on down by the river. They are interested in getting your food if you have any with you. The holy Hindu temple itself is on the other river bank. It’s the one that looks like a pagoda and has a golden roof. You can go closer to it but only Hindus can go in. Our guide was talking all the time and we learned a lot from him, also about these men. They are holy men, sadhus and we saw many of them around. The holy men are followers of Lord Shiva, the Hindu god for whom this temple is. Sadhus typically wear simple sack clothing and they paint their faces with ashes and bright colors. And many of them have an extremely long hair. These holy men are monks that have left normal life behind and now concentrate in meditating. They are trying to reach the final stage of life. Sadhus are not just meditating, they are doing good things in their community. They arrange food for hundreds of poor people every day. We sat down with the holy men and they blessed us with a red mark that they gave on the forehead. Pashupatinath Temple is a third one of the 8 UNESCO Cultural Heritage Sites of Kathmandu Valley. How to get to Pashupatinath: taxi is by far the easiest way. If you are visiting Boudanath and Pashpatinath at the same time you can walk between them. From Pashupatinath you can follow the Bagmati River to Patan, an ancient kingdom 4 km south of Kathmandu. Patan is also called with its old Sanskrit name Lalitpur . Lalitpur means the beautiful city which is right, that’s what Patan is. It’s a city of artists and craftsmen which you can tell from the buildings. Houses, temples and palaces have fine decorations and not just in the old city but also around it. During centuries generations of Nepalese kings used to rule from here the last ones of which were the Mallas. So Patan has really had a big role in Nepal’s history. Patan’s Durbar Square (where durbar means palace) has an old royal palace and temples spread in front of it. Since these temples have so much decoration they look very different from the ones in Kathmandu and Bhaktapur. These ones are also better preserved. Yet the 2015 earthquake damaged Patan as well and destroyed some fine monuments. A part of the Royal Palace has been made a museum of religious art. Patan Museum has hundreds of deity statues from the valley and they show them in a very good, informative exhibition. Durbar Square is the city center and from there there are four main streets to north, south, east and west and all these streets lead to a big stupa. Take the street north and walk a little within the world heritage zone and you will find a special building that has the name Hiranya Varna Mahavihar. It’s the Golden Temple, a Buddhist monastery very well decorated in copper and metalwork. This is pataka, a metal streamer that serves as a ladder. The ladder is there to make it easier for deities to come down and meet us. But there’s more to see in Patan so go out from the heritage zone. Like this gate. It’s Patan Dhoka, one of the old city gates. But Patan is not just history. It is a modern, living Nepalese city that has newer temples as well. Like this shopping heaven we visited on the Valentine’s Day. That’s why the hearts are there. And as you can guess Patan Durbar Square is one more UNESCO Site around Kathmandu. How to get to Patan: taxi is by far the easiest way but there are also buses. The city is small enough to explore on foot. Now about the nature sights around Kathmandu. To see the Himalayas make a day trip to Chandragiri Hills. The hills are just a short way south from the city and one of the best places to take in mountain views. We took a taxi to the lower cable car station which is above the village of Thankot and then the cable car up to 2520 m.
The Chandragiri cable car line is pretty new, it was opened in 2016. The line is 2,4 km long and built by a Swiss Austrian company. The ride is nice, silent and smooth, just like cable cars in Europe. Before the cable car was opened the only way to get up was to hike. Which you can still do. The trail still stands there and follows the cable car line. So why not hike one way and take the cable car the other way? As Kathmandu air often is grey and polluted you don’t see much of the mountains from the city. But once you get higher up the situation is different. If you go up to Chandragiri on a clear day you can see the Himalaya range, the Middle Hills and of course the city of Kathmandu and the valley. We however had bad luck. It was sunny and super clear skies in Kathmandu as we left but it all changed while we were sitting in the taxi. There was a thunder storm, rain, clouds and more clouds. In other words I can’t show you what the Chandragiri Himalaya view is like at its best. We only saw the nearest mountains and a little bit of the Himalayas. But you can trust all other people’s great Chandragiri photos don’t lie. Chandragiri is developing its services on the hill and the hilltop is already full of eateries and beer houses. There’s also a new view tower that costs extra and a modern plastic children’s playground. Those things were not for us but we went to see a temple, Bhaleshwor Mahadev. Places to visit around Kathmandu: Bhaleshwor Mahadev Temple, 2550 m.
Bhaleshwor Mahadev Temple is a Hindu pilgrimage site and has always a lot of locals Hindus visiting. The temple is one of many around the country where the story tells parts of a holy body fell. That makes pilgrims’ dreams get fulfilled. How to get to Chandragiri: take a taxi to the cable car station and cable car up (USD 22 return, 2019). You can also hike up the 2500 m hill along a marked trail from the cable car station. Chandragiri also has a bus service from Kathmandu but at the time we were visiting there was only one bus a day. See the Chandragiri website for bus connections. 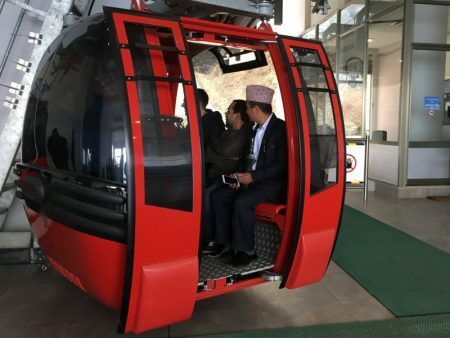 Read more about Chanrdagiri cable car on the website of Chandragiri Hills. After our Chandragiri trip we once more wanted to get close to the Himalayas. As we were wondering how and where our travel agent came with a suggestion. Shivapuri Nagarjun National Park is close to the Himalayas and there’s a place called Prakriti Resort and that’s where we should go. Shivapuri National Park is a bit from Kathmandu and the place we were going to was a three hour drive from the capital, one way. So we could maybe make it as a day trip. Of course it’s better if you can stay the whole weekend but that was out of question this time. Shivapuri became a national park in 2002 after which its visitor numbers have been growing. The park is a part of a hundred kilometer long network of hiking routes that has been built around the Kathmandu Valley. It was a foreign aid project with the Finnish organization Suomen Latu and the aim was to help local people, and the resort we were going to was developed in the same project. Shivapuri Nagarjun National Park is a wooded area with rolling mountains, rich birdlife, monkeys, bears and leopards and above all the park has Himalaya views. So we went to Shivapuri both for the nature and for the views. To be straight, the road was terrible. It had been raining the day before and they were repairing the land slides caused by the rainfall. But we did it! Or in fact not us, it was our driver who did it. He did a hard work. So the first part of our jeep adventure was over and we were happy to get out from the jeep into fresh mountain air. The air up here was cool, the place is at 2000 m.
Prakriti Resort is above Sundarijal that is a popular hiking area, it’s a four hour hike from Sundarijal. From the resort you can walk on towards Chisapani or take some other short trails in the area. The place is also connected to the long trail network through Kathmandu Valley but that of course needs many hiking days. It was Sunday and lunch time so we had a Dal Bhat lunch with Nepalese beer on the resort terrace. I always enjoy Nepalese food but here in the mountains it was super delicious. As we only stayed one day in Shivapuri there was absolutely no time for any hikes so we only walked to the nearest mountain top for better views. The scenery from the top was fantastic though the Himalayas were partly behind white afternoon clouds. This is the resort’s viewpoint on the mountain top and below is the scenery. How to get to Prakriti Resort: you need to hire a jeep. Our jeep was USD 120/day and we booked it through Distinctive Nepal which is the local travel agent we used. Another option is to take a car to Sundarijal and hike.